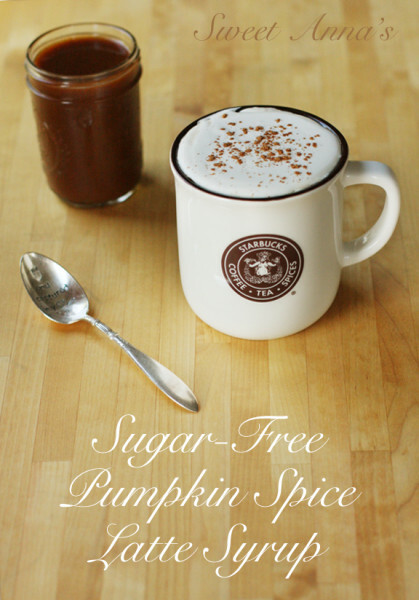 I was driving through Starbucks the other day grumbling to myself that they didn’t have sugar-free Pumpkin Spice Sauce for their famous fall lattes. I have no problem indulging every once in a while, but I would be much happier if there was a sugar-free option for guilt-free treats a little more often! And then I realized that I could just make my own. Why did it take me so long to figure that out?! Yum, yum and YUM. I am so in homemade Pumpkin Spice Latte heaven! If you’d prefer… here is my recipe for original (sugar-full!) homemade Starbucks Pumpkin Spice Latte Syrup! In a small saucepan, heat the xylitol, water and salt over medium heat, stirring occasionally until the xylitol is all melted and clear. Whisk in the rest of the ingredients until smooth and simmer for about 10-15 minutes, stirring occasionally, until the sauce has thickened a bit. Let cool completely and store in an airtight container in the fridge for up to 1 week! THMers (Trim Healthy Mamas!) this is plan friendly! FP, S or E, depending on what you add to your coffee… I like a big cup of hot coffee with a splash of heavy cream! If you like a lot of almond milk in your coffee, then that would make this an E drink. If you take it black with a bit of this syrup, it’s an FP! Mmm! 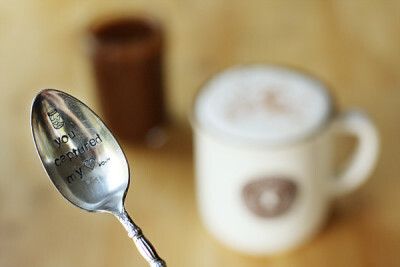 Oh, and I just have to share my sweet little hand-stamped antique coffee spoon with you!